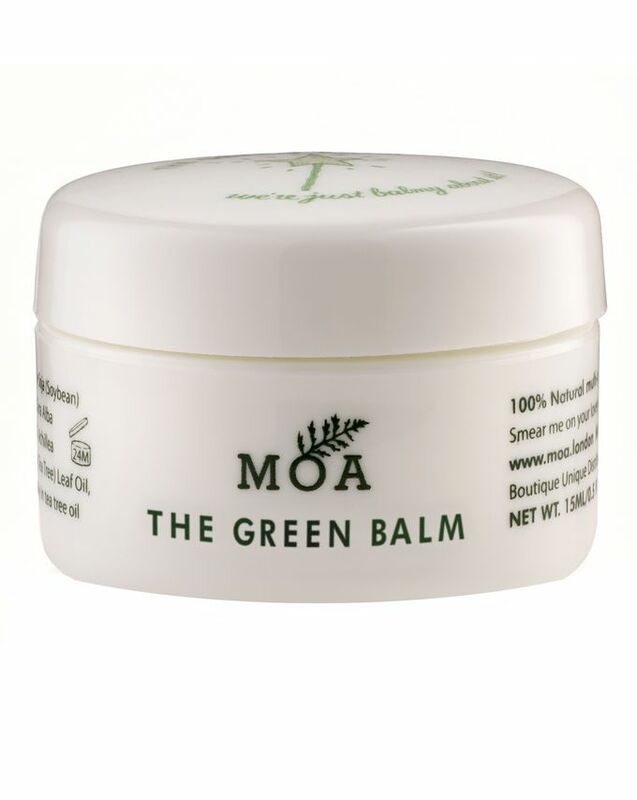 Each pot of The Green Balm combines MOA’s hero herb yarrow (Achillea millefolium), used for centuries to soothe, heal and repair, along with tea tree oil, nature’s powerful antiseptic. Certified organic, its endless multi-tasking beauty and first-aid properties make it a perennial must-have (never leave the house without the pocket-friendly 15ml size)! In fact, this is such a natural product it can even be added to hot water and honey, and gargled to ease a sore throat. Its abilities know no bounds! 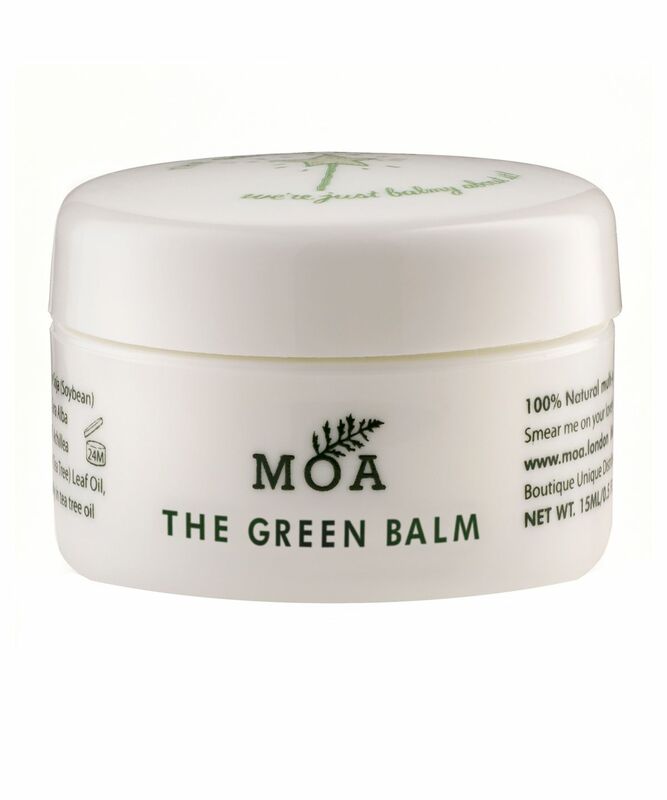 MOA - Magic Organic Apothecary's The Green Balm is an organic healing balm used to soothe, nourish and renew the skin. It's a hard-working multi-tasker that helps to nourish and hydrate dry skin and resuscitate lacklustre locks, and makes a brilliant daily cleansing balm to balance dry or oily skin and eliminate every last trace of residual make up and grime. It can also be used to soothe bites, grazes, bruises and eczema, or as an after-care product for tattoos and piercings. Suitable for super-sensitive skin. Warm balm between fingertips before use. Apply liberally to dry, burned or scarred areas as often as necessary for instant relief and moisturising action. Love this product. I use as a cleanser (removing eye makeup), antiseptic (on minor scrapes etc.) and lip balm in winter and it works great. I always take it travelling as its such an easy and useful multi-tasking product. I have combination skin and find this a little heavy to be left on as an overnight mask/moisturiser, so would advise against doing this unless you have super dry skin. I would also be careful using this as an 'after-care product for piercings' - did not sit well with my cartilage one! This is the only moisturiser I will use on my face now. I had a severe allergic reaction 2 years ago and afterwards decided to switch to all natural skincare. It healed my skin after the allergic reaction and has helped clear most of my acne too. It can take a while to absorb, but mix it with your foundation for seamless makeup and use it whenever you get dry patches. Perfect for everyday use and for overnight. I honestly cannot recommend it enough. I'm on my 7th jar already! I struggle with eczema and extremely dry skin on my hands. I tried applying this but the texture is so thin and greasy it just felt like I’d eaten a bag of chips with my fingers. It moisturized them about as much as the chip fat would have too. As a last ditch to make this product useful for me, I tried it as a lip balm - would not recommend! As someone with very dry skin, I tended to use it for rough areas on my arms and legs. It feels quite heavy for the face so I only used it for sensitive areas/post iffy products that left my face sensitive. It's great and reasonably priced. I was highly hopeful with this product after reading such good reviews and also after listening to few you tubers. Unfortunately, this product didn't help me at all with dry skin patches or acne spots. Rather I have broken out so bad wherever I have put this on - mainly around my mouth areas. I have so many dark spots now around this area and some live acne which is making me very upset. Love this little pot of goodness. Bit of a strange consistency, almost grainy but when rubbing in it disappears to a velvety oily balm that does wonders for my skin. Best to use sparingly at night, mainly for dry or chapped areas or as a treat/mask. Smells gorgeous and refreshing. Good for burns, dry elbows and patches dried out by intense spot creams. I use this as a cleanser and really like it, and I am incredibly fussy with balm cleansers. Definitely needs work to take off, unlike balms that contain emulsifiers, but not as thick as something like the Sunday Riley balm or elemental herbology (my skin hates beeswax though). Love the smell, not too teenage-spot-stick tea tree, just sort of herbal and botanical. The green jar travels well too in my experience. Great for eczema that is in the mild to medium severity range - but because it is an oil (coconut) it's not helpful for really severe cracked skin for which only turmeric cream works in my experience. But it's fantastic all the same and weirdly efficient for cystic spots. I'm not particularly tolerant of coconut oil but this is one of those magic formulations that works out fine. So I highly recommend it as it is a great lip balm, eye cream, and deep spot killer - while conditioning the skin. This is my holy grail product. My favourite way to use it is as an after shaving balm on my legs, leaves them so soft! Its great for eczema and any dry skin. They need to make this in a bigger tub! I have to buy 2 or 3 pots at a time to make sure I have back ups. There is nothing, nothing that this balm can't handle! As far as skin complaints go, this stuff's Incredible Hulk in a pot and I've used it for so many things over the past couple of months, and it's worked like a charm every time. A tiny bit under my eyes at night has gone a long way to improving any dark circles. If you don't have this, it's time to get one. This little pot does everything, much better and cheaper than other creams and balms. A must have! i am so impressed with this product. im a big fan of balms in general and have been addicted to eight hour cream for years now. this has replaced it. it smells delicious, slightly medical, slightly herbal i love it. i use it for cleansing, moisturizing - its cleared up my oily skin better than any of the harsh things i've used before. its made my hair beautiful and i have incredibly difficult hair. what else? it cleared up a coldsore i had in two days. soothes shaving rash keeps my eyebrows neat also amazing amazing amazing at fading scars and making them less tight and painful. i cannot praise this product enough. Other people have already reviewed the great powers this little fellow has, the only thing I have got to say about that is : IT's ALL TRUE! Now the crazy thing: This balm makes me feel better in every way. I was passing by a rough time when I bought it, and every one knows that good cosmetics can cheer up a girl's soul but this is a true caretaker. I don't know if is the smell of...well green stuff :) Makes me feel like I can take care of myself. Do you know that great food you eat when you're down? It's not the fanciest or the most expensive, right? Probably will be some slow nice and simple food... This is the same in a skincare way. There are good products around here, but this one truly deserves the Cult label. Bought this after reading reviews from people who’d used it on eczema prone skin as my face was going through a bad flare up. I was originally using this as a cleansing balm but I had to stop as it made my face eczema a little worse. It worked wonders as a nourishing balm on my body eczema though. The little tiny pot is a great lip balm size! As it has a balm-y texture, I preferred not to apply it on the whole face yet only on my very dry lips and around the eyes at night and it worked wonderfully. I bought the mini size which for the only lips is the perfect quantity, but if I'll buy the bigger one I'll apply it on my body rather than my face. If you have acne stay away from this product! It broke me out so badly you can't even imagine. It's not worth the risk. Honestly, I put this on underneath my BB cream, and as someone with SUPER dry skin, it's incredible 10/10. This nourishes my dry and sensitive winter skin without causing spots...fabulous. Great treatment but not an oil cleanser for everyone! This is a magical formulation for soothing a multitude of complaints from dry patches to cold sores! Unfortunately it did break me out when I used it as an oil cleanser (it is still coconut oil which my skin doesn't love), however super effective as treatment. Unfortunately I received this item and it seems that it has already been opened so not brand new to me. I am a bit disappointed and would have expected this not to happen with cult beauty. The trouble is I bought the small version so not worth returning because it will cost me more in postage. I'm sure the product is amazing but don't trust to use. I purchased this balm a few months ago and I have very dry, sensitive and sometimes acne prone skin I wasn't very hopeful. But this product is amazing. It has helped clear up my skin so well, I can't go a day without it. I am going to buy little pots for all my friends - everyone needs this. I love this as a lip balm and also general all purpose cream to treat dry areas. The smell is wonderful and the soothing effects are immediate. I'm so pleased I found this and thank you for those other reviews who helped me decide to purchase. Reviews are invaluable! This is a wonder. Every February I get a dry patch of skin on my neck that I've previously only cleared with prescription creams. I tried this last year and it was healed in 48 hours. This year I used it preventatively and for the first time in five years I didn't get the usual dry patches. It has also soothed my sister's burn and a friend's eczema. It lasts for ages as you only need a tiny amount. As with most balms it is also a good lip balm. Well what can I say - this stuff is amazing. I've used it on spots, dry skin, dark circles, sore patches...The list goes on - this seems to cure practically anything on your skin! Worth every penny! This balm is just great for anything. I've tried it under my eyes, on my cheeks (with enlarged pores), on my lips, my hands, nails, feet...It has an amazing effect on all areas of my body where I've tried it. The smell is really natural; you won't have the impression you're putting chemicals on your body, just pure nature. The balm softens the lines under my eyes, softens the lips, makes my pores look smaller, softens my hands & feet...it's a miracle worker. I originally ordered the mini of it here at Cult Beauty and have just ordered the 50ml size because I love it so much. The small pot is really a good way to try it for a reasonable price! Having had a problem with painfully chapped lips (and being on the verge of being referred to a specialist because of it) I tried this balm after trying everything on the market - medicated/over the counter/expensive/cheap or otherwise. Quite simply, this product has stopped whatever the irritation was in its tracks - my lips and the surrounding skin around my mouth is now normal after 5 days of using it! I no longer look like the Joker from Batman! Please try it if you have any kind of skin irritation - I can't tell you how happy I am!!! This product can be used from first aid to nourishing to cleansing. It is extraordinary and every household should have a pot. love love love this miracle product! soothes dry patches and lips. I had a coldsore and it cleared it right up. Use it once a week as a treat to cleanse my skin - FAB!! I put it onto dry skin and massage it around and wash it off with a hot cloth - DEVINE! my skin looks great after it. Ive only bought the small pots to date but will defo be buying the bigger one soon! This green balm (and it is green!) is perfect for soothing away annoying patches of dry skin - often the result of kissing boys with too much stubble, ahem. I've also been using it to get my feet into shape for sandal season, softening up dry hard wintry heels. You have to warm it on your fingertips before applying as it's quite hard. It also has a lovely herby smell - you know it's doing you good!